Another holiday story today, allow me to introduce you to Do You Believe in Santa? by Sierra Donovan, the first in her Evergreen Lane Contemporary Romance series. Please read on for my review and excerpt, be sure to check the tour stops to see what other readers thought of the title, and don’t forget to enter the tour-wide giveaway where you could win one of 3 Paperback copies of DO YOU BELIEVE IN SANTA? Apparently I only seem to find Sierra Donovan during the holidays! My introduction to this author was with another sweet Christmas story, and Do You Believe in Santa is no different. The first book in her Evergreen Lane series with a nod to the classic Miracle on 34th Street. Mandy is a believer, so much so that her friends call her Mandy Claus, reinforced by the fact that she works in a Christmas themed shop in her hometown of Tall Pines. At eight, Mandy is sure she saw Santa, and this has reinforced her belief in Christmas and the miracles that can come. Jake Wyndham is in town looking for a new site for his hotel. Intrigued by Mandy, he’s curious about her and her nickname. But, for someone looking to turn the small town feel of Tall Pines onto its ear, he really needs an ally. For Mandy’s part, Jake is everything she wants in a man: kind, employed, ambitious and intriguing, she just hasn’t sussed out his feelings about Santa, and with him not knowing the story that led to her nickname, perhaps he can accept that as well as her. Donovan brings an innocence and lightness to this story, as Mandy has a childlike feel in her beliefs and hopes for the season. Never quite diving over the line to make her immature or unlikable, she’s just that friend with a quirk that many of us have lost when the kid at the desk next to you tells you the ‘real deal’. Mandy proves that Christmas spirit isn’t just a “thing” for December, but an opportunity to bring kindness and joy year round. And when Jake realizes the truth, and starts to see the intrigue of Mandy is far more than he initially thought, the story turns to a wonderful romance, sure to please readers everywhere. When Mandy Reese was eight years old, she saw Santa Claus. She slipped out of her room on Christmas Eve after her mother went to bed. As Mandy tiptoed down the hall, trying to be silent, she thought of the poem: Not a creature was stirring, not even a mouse. . . . Barely daring to breathe, she waited. The lights from the tree were bright enough to show the time on the clock over the mantel: almost eleven-thirty. Mandy’s vigilant eyes drifted from the fireplace to the tree and back. She knew there was no way she’d fall asleep. But it felt as if some time had passed when something made her sit up. The only light in the room still came from the tree, yet somehow it seemed brighter in here. Her eyes darted to the fireplace. And he was there. He did wear a red suit, although it was a darker red than she’d seen on the Santas at the store—the ones she’d always been told were just helpers for the real Santa. His beard was full and white, his eyebrows were bushy, and his eyes were blue. Not quite twinkly, a little more serious than that, but warm and friendly as they met hers. She’d heard that watching for Santa could make him pass you by, but that hint of a glimmer in his eye told her she wasn’t in trouble. Mandy opened her mouth to speak, but she couldn’t think of a single word to say. The whole room felt hushed, as if time were standing still. She couldn’t be dreaming because her heart was beating so fast. But she remembered to pinch her forearm, hard, just to be sure. It hurt, all right. He took a step backward, toward the chimney, and raised a black-gloved finger. At first Mandy thought he was going to put it to his lips, signaling her to be quiet. But he rested it alongside his nose, just like the poem, and nodded. The room brightened, and Mandy had to shut her eyes against the glare. When she opened them, the light in the room had returned to the normal Christmas-tree glow, and he was gone. She heard the clock on the mantel ticking; she didn’t remember hearing the sound while Santa was in the room. The hands showed it was just after midnight, although she knew for certain she hadn’t heard it chime. She pinched her arm again. Once again, it hurt. When she looked down, she saw a small red mark forming right next to the spot she was pinching now. Under the tree, she couldn’t see any difference in the number of presents. But she remembered what her mother always told her: Santa Claus was about more than presents. “I saw him,” she whispered. When Mandy told her mother about it the next morning, her mom checked the doors and windows and counted the presents under the tree. “I thought you believed in Santa Claus,” Mandy said. “I do.” But the worried look didn’t quite go away. The memory of her mother’s reaction kept Mandy from mentioning Santa when school started again in January. If her mom didn’t believe her, the other kids surely wouldn’t, and Mandy didn’t want to fight about it. So she kept it to herself, like her own special secret. Until the next school year. It was mid-December, and she was leaving school Friday afternoon to catch the bus. There hadn’t been any snow for a couple of weeks, but there was a snap to the air as she walked. Mandy was so busy looking up at the sky for signs of snow, she didn’t see the crowd outside the gate until she was nearly there. Students clustered around an auburn-haired woman who held a microphone. A man stood nearby, aiming a video camera at the woman. Then it clicked. Mandy had seen her on the television news. As the kids crowded around the reporter, she held a microphone in front of some of them, one at a time. Most were younger than Mandy. Older kids jockeyed behind the TV reporter, trying to poke their heads into the picture. “I believe he’s real,” a little blond boy, probably a second-grader, said. “He always eats the cookies we leave for him,” a fair-haired girl, who looked like his sister, said. Mandy joined the group as if drawn by a magnet. Since many of the children were shorter, she could see over their heads. “What about you?” The reporter aimed her microphone at a brown-eyed girl with short black hair. “I used to believe in Santa, but I know better now.” That was Julie Ashman, from Mandy’s own class. Mandy felt her blood start to simmer. Being wrong was one thing, but saying things like that in front of these little kids . . .
“Santa Claus is a fake!” one of the taller boys behind the reporter shouted toward the microphone. “No, he’s not!” The little blond boy looked faintly horrified, and Mandy could see uncertainty creeping into his face. The reporter tried to regain control, turning her microphone toward the smaller boy again. “Not your dad, all dressed up,” the older boy scoffed. Suddenly the microphone and the camera were pointed at her, and Mandy felt the words rush out, spilling the details she’d played over and over in her mind. The story she’d kept bottled up for nearly a year. Sierra Donovan is a wife, a mother of two and a writer, though not always in that order. Her greatest joy is helping people find true love on the printed page. She is a firm believer in Christmas, classic movies, happy endings and the healing power of chocolate. Sierra’s first novel, Love On The Air, was a Holt Medallion finalist. Her 2014 Kensington debut, No Christmas Like The Present, won the Golden Quill Award for Sweet Traditional Romance. 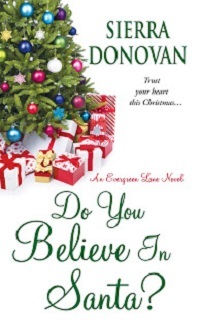 Her 2015 novel, Do You Believe In Santa? marks the beginning of Sierra's new Evergreen Lane series. You can email Sierra at sierra_donovan@yahoo.com, or visit her website at www.sierradonovan.com. Thanks for reviewing my book and featuring on your blog. Merry Christmas! Thank you for the story – good luck on the release!